Event Description: An intriguing site for a corporate team building event, the multi-million dollar Marine Corps Museum is a place to enjoy, for military buffs and not. Designed by Curtis W. Fentress, the striking exterior design is meant to “evoke the image of the flag raisers of Iwo Jima, Inside you’re greeted everywhere by authentic planes, tanks and helicopters, all in pristine condition. A walking tour through this place is like a walk through history, with exhibits detailing Marine Corps life from Leatherneck times to the present day. During your corporate team building treasure hunt…you might see: A WWI trench; a Vietnam-era Skyhawk; a Pershing Tank in Korea; an exhibit about the ins and outs of boot camp, and a whole lot more. Gather at the main entrance of the museum. Want something closer to D.C.? 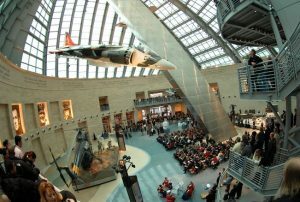 Check out our *INDOOR PROGRAM* at the Smithsonian Air & Space museum in Washington, D.C.!